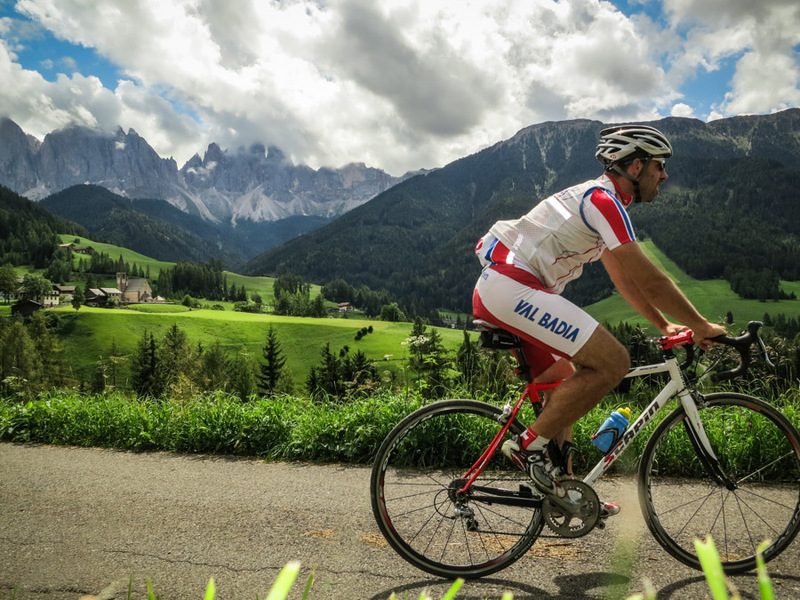 You’re riding Passo delle Erbe towards San Pietro di Funes downhill and you are so focused on the narrow winding road that you just don’t take the time to look on the left side. Note that the picture above was taken directly on the road. You’re riding uphill towards Passo delle Erbe, but you find yourself pushing up a 16% grade climb. You’re having a hard time to keep your balance and pace, and you really don’t care about what is around you – you just hope this agony comes to an end soon! So, you see, you can still ‘enjoy’ the view either by going uphill or downhill. But, the direction of the ride I recommend here gives you a chance to enjoy more of the beauties that the Funes Valley has to offer. So, follow the description carefully and, if you want the GPS track, you can download it above. 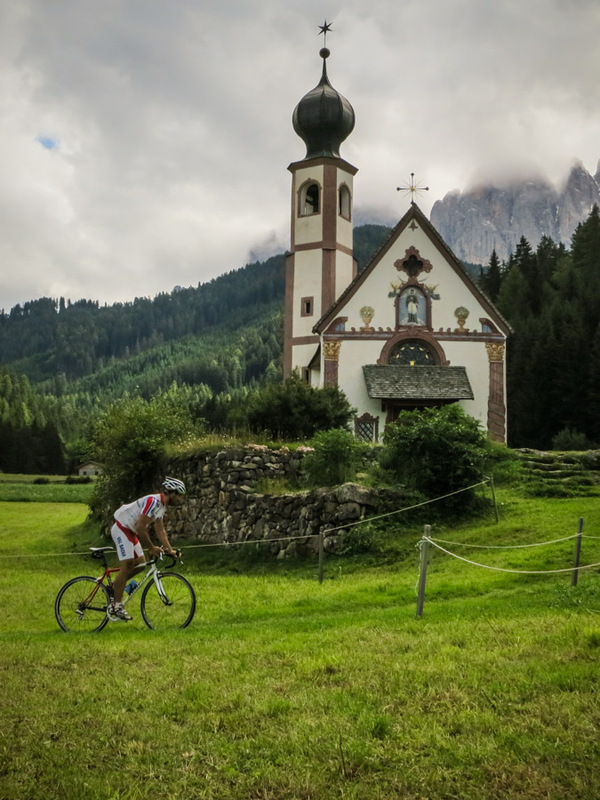 This is not only a cycling ride … it’s a pilgrimage! Starting in Badia head north (downhill) on the SP244 towards Piccolino/San Martino in Badia. 2 km before you reach this junction you may already have seen the “Ciastel Tor”, the castle above the town of San Martino in Badia. You will pass nearby it and you may already guess that there is a nice little climb to reach it. At the juction, turn left following the signs to Passo delle Erbe. There is a water fountain to fill your bidons on the left side of the road in the center of San Martino. You’ve reached the top of Passo delle Erbe. Time to put on your windbreaker jacket because it’ll be a long donwhill (interrupted by a little ramp). If your bidons are empty after the long climb to Passo delle Erbe, this is the place to stop – there’s a cold, fresh water fountain in between the barns you see here. You’ll love it! Turn left and follow the signs towards Val di Funes. Now you have a 2km climb towards the anonymous Passo di Eores. It’s short and easy, then the roads starts to go downhill again. 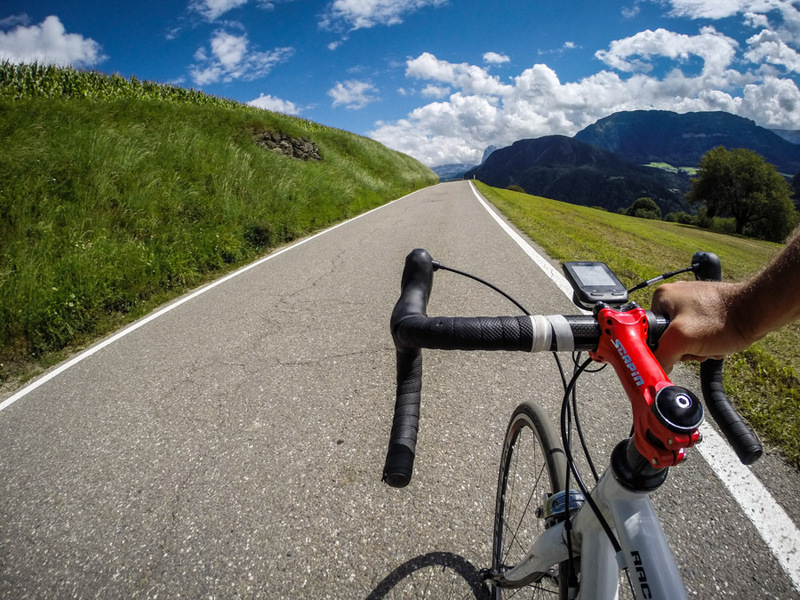 Continue to follow the signs towards Val di Funes and ride straight on. From here onwards, for the next 2 km, remember to look on your left and admire the views of the Val di Funes and Odle group. Here you have 2 options. At this hairpin you can turn right and go towards San Pietro di Funes and continue the ride downhill. 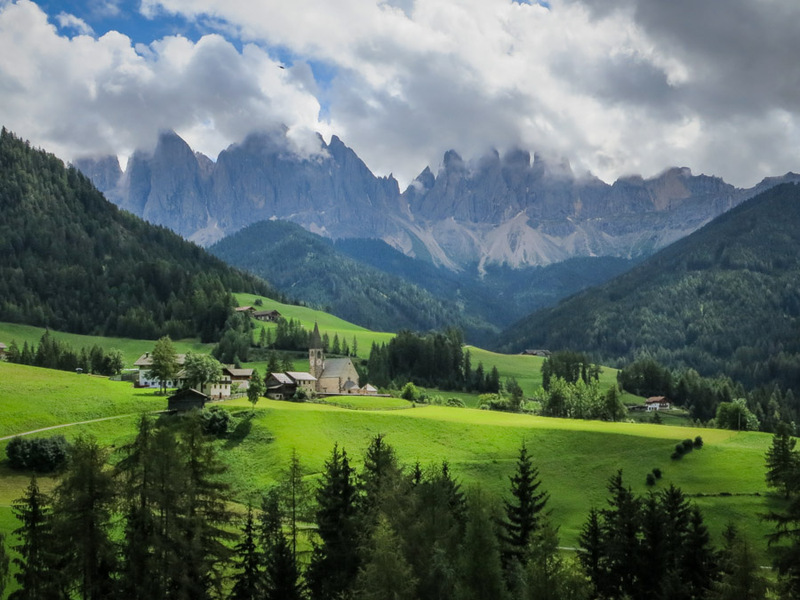 Or, you can continue on to visit two of the Val di Funes’ hidden ‘gems’. In this case, continue on straight at this hairpin, where you’ll ride on a tiny, narrow road that passes a couple of farms. You connect again to the main road. Stay on this road until the next junction. Turn right following the signs of San Giovanni. After 400 meters, you turn right and pass in front of a local farm. Ride towards the meadow until you reach the tiny Ranui church, a place to take wonderful pictures. After you’ve finished posing in front of the church, go back on the same road for less than 1 km, where the first group of houses is. Go over the little bridge and follow the tiny road in direction of Santa Maddalena. 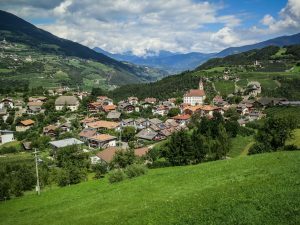 After 1.5 km the road will become unpaved – just follow the walking path signs to Santa Maddalena until you reach the church seen on the main picture of this post. Now you’re at the church of Santa Maddalena! 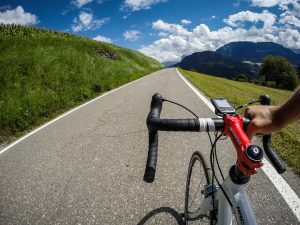 OK, you’re right, it isn’t a great photo opt from up close – just ride further along this road from where you’ll have a great view for another series of pictures. Then just follow the same road towards Chiusa/Klausen …. BUT …. pay attention! You’ll need to turn left on a side road that is hard to see if you speed down at over 50km/h. This is not the junction but it’s 200 meters up ahead. Pay attention, first you’ll see big quarry on the left side of the road. The road makes a long left turn before turning right again. On this right turn – on the left side of the road after the quarry – you’ll see huge amounts of carpentry wood stacked there. Here it is: the first road you see on the left side is the one you need to take. There is a sign indicating the direction to Gufidaun. It’ll seem as if you’re entering the carpentry area. But that’s not a problem, just go ahead and go over the little bridge. You’ll find yourself on a narrow side road (not really well-paved), in the middle of a forest. 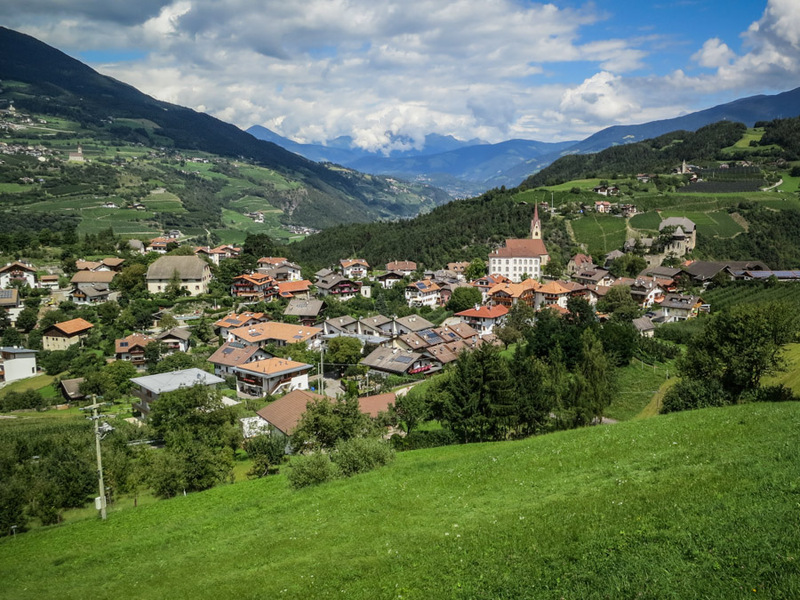 You’ll feel like you’re in a fairy tale…if it weren’t for the 10% climb that’s taking you to the little town of Gufidaun! You’re entering the town of Gufidaun. On your left side is a water fountain. Make sure you start the next climb with at least one full bidon because, on a warm day, the climb will demand all you’ve got! After going by some of the houses, turn left. If you look in front of you, there are no signs because they are mounted for the cars coming from the opposite end of the road (remember we are coming from a side road). The road sign says Laion and that’s our next goal. But, before you reach the town of Laion, be prepared! Because you need to ride a 4.2 km long climb with an average grade of 11%! If up to now you thought that the Dolomites passes were hard, you were fooling yourself! I’ll tell you a secret: there are many side roads that are much harder! Climbing lovers will drool in ecstasy on all the rides. You are in Laion now and, on the right side of the intersection, you’ll find a water fountain. Turn left here, in the direction of San Pietro and Val Gardena. The road continues up&down for the next 3 km until you reach a nice, steep downhill towards the main road that goes from Chiusa/Klausen to Val Gardena. Up to here, you may have enjoyed the fairytale loop, encountering very few cars, in the state of a dream. But, now it’s time to WAKE UP! You intersect with the main road that takes you to Val Gardena and up to Passo Gardena. As one of the Dolomites’ main arteries, this means you’ll have continous, buzzing noise in the background. From now on, just follow the signs to Passo Gardena, going through (in order) the towns of Ortisei, Santa Cristina and Selva di Val Gardena. If you’re feeling thirsty, in Selva di Val Gardena you’ll find a water fountain on the left side of the road. But there is another one not far away – also on the left side of the road - exactly where Passo Gardena begins. The top of Passo Gardena. From now on it’s smooth sailing downhill to the starting point in Badia. You’ll be riding through the towns of Colfosco, Corvara and La Villa, in that order. Welcome back! Hope you had a nice ride!